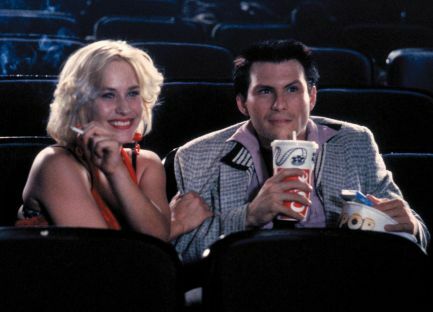 Christian Slater and Patricia Arquette enjoying a movie in one of director Tony Scott’s best films, True Romance (1993). The film was written by Quentin Tarantino. It’s amazing how many films have scenes where people are in a movie theatre watching a movie. You are watching a movie about someone watching a movie. I don’t mind, but it’s a funny thought. Sad fact: Tony Scott and 3 big names from this film (Dennis Hopper, James Gandolfini, and Chris Penn) all passed away within the last 7 years. Hopper was the only one that wasn’t taken before his time. Posted on August 7, 2013, in Movie Picture of the Day and tagged Chris Penn, Christian Slater, Dennis Hopper, James Gandolfini, movie, Movie Picture of the Day 8/7/13, Patricia Arquette, Quentin Tarantino, Tony Scott, True Romance (1993). Bookmark the permalink. Leave a comment.